Physics was my favourite subject in high school. I still find it fascinating. 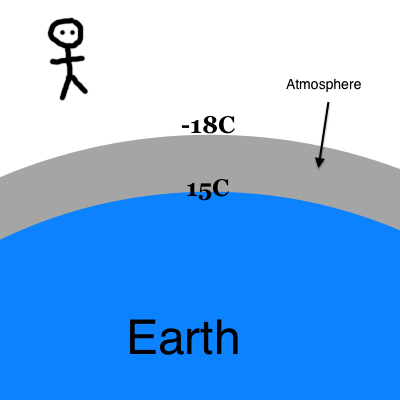 This week I learnt something new about our Earth and its temperature and I want to share it, because explaining something to someone else, is often the best way of understanding it yourself. If we want to know what the temperature of our planet is, we need to know the rate at which energy is coming into our planet and the rate at which energy is going out. The temperature of our planet is a balance of this flow. At the planet gets hotter, it loses energy faster to space. When what goes out equals what comes in, we have our equilibrium temperature. 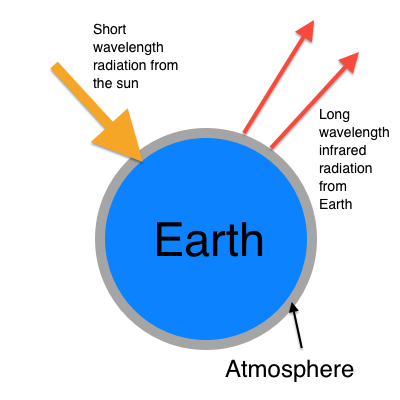 The Earth gets its energy from the sun in the form of short wavelength radiation. These shorter wavelengths are able to pass through our atmosphere to be absorbed by the Earth. Some of this radiation is also reflected by clouds and particles in our atmosphere back into space. 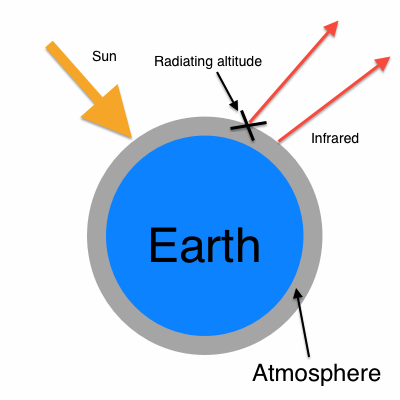 The energy that is absorbed by the Earth, then gets re-emitted as infrared radiation. Infrared has a longer wavelength than the energy from the sun and cannot pass as readily through our atmosphere as did the shorter wavelengths from the sun. In particular, carbon dioxide (CO2) loves infrared. It has a very high rate of absorption in the infrared. The further up into our atmosphere the infrared travels, the thinner the atmosphere becomes. Eventually, when the atmosphere is thin enough, the infrared escapes into space. If the Earth absorbed more radiation from the sun than it emits to space, it would heat up. Similarly, if it absorbed less energy from the sun than it loses to space, it would cool down. 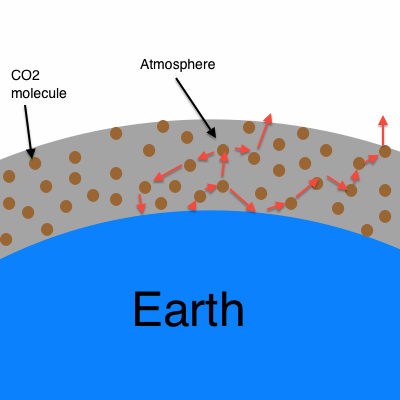 When we add greenhouse gases, such as CO2, to the atmosphere we raise the altitude at which infrared can escape. This means that the infrared now needs to go higher up before it can escape, effectively making our blanket thicker. This altitude is called the radiating altitude. 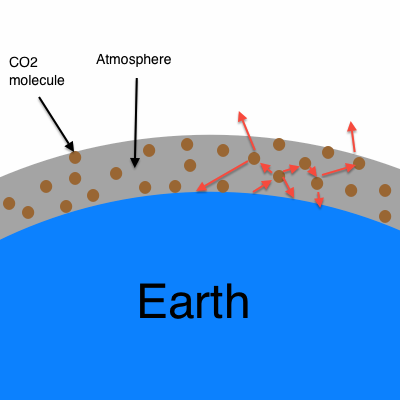 We can think about those CO2 molecules in our atmosphere as little bubbles floating around. Infrared radiation (depicted as red arrows in my diagram above) gets absorbed by those bubbles and causes them to vibrate and bend. They eventually re-emit the infrared in random directions – which could mean heading back down to Earth. This infrared bounces around from CO2 molecule to CO2 molecule in random directions. If it gets high enough to reach the radiating altitude, it can escape into space. When we increase the amount of CO2 in the atmosphere, we increase this radiating altitude. An increase in altitude of 1km corresponds to a surface temperature increase of about 6C. If I was in space looking down on the Earth, the Earth would appear to have a temperature of about -18C. This is called the radiating temperature. But the surface of the Earth is much warmer than this, more like 15C. This difference between surface temperature and the radiating temperature is accounted for by greenhouse gases. The same phenomenon occurs when you’re snug under a blanket in bed. The temperature from above the blanket is colder than the temperature from beneath it. Here’s the really interesting bit. When we increase the amount of CO2 in our atmosphere, we don’t change the radiating temperature. It stays fixed at -18C, no matter how much the Earth warms. Instead, we change the altitude at which infrared radiation can be lost to space. If we stand on the outer edge of our atmosphere and travel towards the ground, the rate of temperature increase as we go down is approximately fixed. But when we increase that altitude through CO2 emissions, we now have to travel further to reach the ground, so we wind up with a higher surface temperature. This is not some new, fandangled, untested physical theory. These ideas have been around for more than 100 years. It is high school physics. The changes we’ve seen in our climate so far are not all we’re committed to as a result of the greenhouse gas emissions we’ve made in the past. The planet has not yet caught up with what we’ve already done. We have only seen the effects of somewhere between one-half to two-thirds of the amount of CO2 currently in our atmosphere. So even if we stopped all greenhouse emissions tomorrow, our planet will still continue to warm. Posted in Climate change and tagged Climate change, co2, energy equilibrium, global warming, greenhouse effect, greenhouse gases, physics, radiating altitude. Bookmark the permalink.